For people who know me, it may come as a surprise to learn that I am not a fan of Dungeons & Dragons. Frankly, I was smack dab in the middle of the D&D demographic and many (most?) of my friends played. But I never got into it. Perhaps this was because I simply didn’t have the time to play it consistently, perhaps it was because when I did play it was not with a good Dungeon Master. I really don’t know why I never got into it, but I never did. The one thing I really liked about D&D was the creation of characters. When I was a kid, characters were created by rolling a set of polyhedral dice to determine how strong the character would be, how healthy, how smart, how friendly, etc. In the newer editions there are point sheets or lists from which these characteristics are assigned (cue the old man in me as I say, “Meh, why’d these whippersnappers have to go and change something as simple and elegant as that, ehh Sonny?”). I used to enjoy creating characters using the set of D&D dice I got one year for Christmas. I’d roll the dice and create these characters — naming the toughest characters with the wimpiest names I could come up with or naming the least dexterous characters with names that implied gracefulness. I would build dozens of characters this way for no other reason than to create them. Their character sheets were quickly tossed aside never to be looked at again. That is, until I created the character called Swan. As I said, I was not a big fan of actually playing Dungeons & Dragons. But I was always writing stories One day I was lacking a character for the story I was writing. I had no idea who the missing character was, just that I needed one. So, I grabbed my D&D dice and started rolling. By the luck of the rolling dice, Swan was unintelligent, sick, unlikable and had what amounted to two left feet. But he was physically stronger than one could ever imagine. I sat there staring at the scribbled numbers which defined this character and shrugged – clearly this was not going to solve the problem in my story. But as I started packing up my dice, a story started developing around Swan. I saw entire armies of any and all species attacking him with any and all sorts of weapons and magical spells… and Swan didn’t even break a sweat fending them off. I saw him standing there humming peacefully, sipping a coffee in one hand while destroying whatever foe came at him. He avoided crowds in general and refused to be in the company of children because he was embarrassed that children knew more things than he did. He single-handedly protected the land from everything the universe threw at it. The rest of the soldiers and politicians grew comfortable that Swan would just take care of everything, so they went about their lives an left him alone. One day the enemy country sent a few young kids over, presumably to show an attempt at making peace. The diplomat who should have greeted them was busy playing video games and so he walked away from them. The arrival of the kids was suspicious and strange but hey! It was just some scrawny little kids, right? So, Swan greeted them with an awkward grin and sat down. When the scrawniest of the kids (named Bruiser) shuffled up to Swan and sneezed on him, it was just kind of gross… except that Swan was not a particularly healthy man. This one sneeze overwhelmed Swan’s immune system and brought him to his knees. Before anyone knew it, the war was lost and it was all because of a kid who was trained by the military to not cover his mouth when he sneezed. Characters, no matter how strong or talented or capable they may be, always tend to have some sort of flaw or weakness they struggle to overcome. I’m flawed. You’re flawed. My amazing, athletic, intelligent, beautiful, perfect children are flawed. It’s part of what makes us real and part of what makes it critical that we work together to overcome whatever the world throws at us. My weakness might be your strength, your weakness might be something I do well. To be realistic and believable, characters in our stories need to have flaws and strengths just like we do. In my character, Swan, the less flawed I tried to make him in terms of specific characteristics, the more flawed he – and the story – became as a whole. If a character does not recognize their area of weakness, then other characters usually do. Adversaries try to take advantage of weakness. Allies will attempt to compensate for weaknesses. This is true in life and will be true in most stories as well. I always think of things like “opposites attract” and wonder why this seems to be a Universal Truth… but to some extent it just makes sense that I would seek out friends and partners who round out my rough edges. Swan’s weakness was his health and his lack of intelligence… had he been able to recognize that the kids who came to see him were sick, perhaps he would have refused to grant them an audience. Alternatively, had his colleague recognized that Swan was unable to manage situations such as this, perhaps he’d have put his video game down and distracted the enemy children. Characters in our stories should know their own abilities in much the same way we know our own. It’s okay to let the characters test their limits, but much like we all have our own strengths and weaknesses, the characters must recognize that about themselves too. That is, unless their flaw/weakness is that they cannot recognize this about themselves. No matter how much of a hipster a character might be, without a really good reason they are not any more likely to do unexpected or out-of-character things than a real person is. I don’t like heights. I’m not afraid of heights, I just don’t like them. It started when I got glasses (I remember this distinctly). Basically, I always fear my glasses will fall off and go crashing to their doom. As a result of this dislike of heights, I tend to avoid ladders. I’ll get up on a ladder when needed, but I will keep my feet on the ground as much as I can. Last year, while on vacation, I decided (read: was convinced by the teenagers vacationing with me) to go on the zip-line. I found myself tied to a rope, dangling from a platform 40 feet in the air, then hurtling downhill at what felt like faster than the speed of light. Clearly, I survived the event, but it took me a long time to recover from such an out-of-character activity. The entire time I was waiting for my turn to run off the platform, I felt every cell of my body trying to turn me around to walk the other way. It was out of character for me and I knew it (as did everyone else on the trip with me). Similarly, I’ve had characters in my stories get to a point where they refuse to cooperate with me. The character afraid of flying who is suddenly about to sky dive just for fun? Nope. He won’t do it. The character who is afraid of swimming because her parents, grandparents, sister, brother, best friend and favorite puppy all drowned? She’s not likely to suddenly decide to participate in a synchronized swimming event. Clearly, characters can grow and change and can overcome their fears or weaknesses, but if the skill is not part of their original characterization the story has to be written so that they change and grow into that new behavior or are forced into it by circumstances within the story. In my example here, Swan would never have sat with the children because he hated children. Had he stuck to that bit of his character, he’d have avoided the sneeze which lost them the war. Every attempt I made to make him like children or avoid this interaction weakened not only the character but also the story itself as each change required other changes elsewhere in the story to make it all fit. You can’t change someone into something they are not. This is true in life and in writing (at least my writing). Every character you imagine is worthy of being remembered. In any creative writing class, you will hear that you should never discard anything you create. Story passages, plot ideas, character sheets – these are all important bits of creativity that may not be useful right now but may become useful down the road. I find this especially true with characters. I write by the seat of my pants, so ideas float in and out of my mind all the time. Characters show up, say hello, and then stand there waiting for me to do something. I don’t always know their backstory or their purpose in my creative universe, but I take note of them and file them away until such time as they are ready to share their story with me. Sometimes the characters refuse to share those stories and I just start inventing them. It’s a good exercise to take a character and just write for a bit, throwing everything you’ve got at the character to see how they react. Doing so can tease out the little character flaws and strengths within them and may even turn that random character into something quite special. The bottom line for me is that characters in our stories are just like us in many ways. They have hopes and fears, dreams and desires, strengths and weaknesses. As writers, it is our job to figure those pieces out and help these characters be true to themselves. Swan is a useless character to me today, but every once in a while it is a good exercise to trot him out of my little Cavern of Characters and send him off on some wacky adventure. The resulting story may not be literary gold, but the benefits of flexing those writing muscles, exploring new ways of characterization and helping a character to grow and change are enormous. So what do you say? 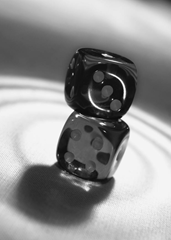 Why not roll the dice, create a few new characters and send them off on an adventure? You may be surprised at what they will help you discover. I could lend you my Dungeons and Dragons dice if it helps. This entry was posted in Rob Diaz and tagged character building, characterization, characters, writing. Bookmark the permalink. I fit the same demographic that partook in the D&D revolution a few decades ago. I only got into it peripherally also. But, like you, I was fascinated by the randomness of the ten-side, twelve-sided, and twenty-sided die. I often found myself rolling the ten-sided die like a magic eight-ball to determine my chances of some fortuitous even occurring (read: will the girl in my class say yes if I ask her to the dance). But, I digress. I struggled with those pyramid shaped 4-sided die because they never seemed like I could get a good “roll”. I usually ended up flinging that thing way up in the air, giving it a good spin as I did so, then hoping it wouldn’t roll off the table or onto the carpet and invalidate my roll entirely. So… how often was the ten-sided die right about that girl in your class? I encountered D&D quite late in life, through my creative writing students. Seeing as I was transparently fascinated by the concept of the game they easily convinced me to let them teach me. So we dedicated some lessons to a mixed form of D&D and creative writing. We invented characters, created worlds, established laws and helped our characters live by them or rebel. The rules and borders of the game led to bursts of daring creativity in the classroom (and in my notebook). It was amazing. Thanks for reminding me how pleasurable, powerful and playful these character building tools are. And thanks for doing so in such a graceful and sincere way. Wow, I can see how this would be a fantastic tool in a writing lesson in the classroom. It sounds amazing and I wish I’d have had that experience in the classroom! Weird. It’s even referring to another dude named Diaz. No (known) relation to me. Strange timing, for sure. The idea for my post came from me coming across the old set of dice while I was looking for something in an old box in the basement. This post gives new meaning to the phrase, the roll of the die! I love the name Swan, especially for a man.